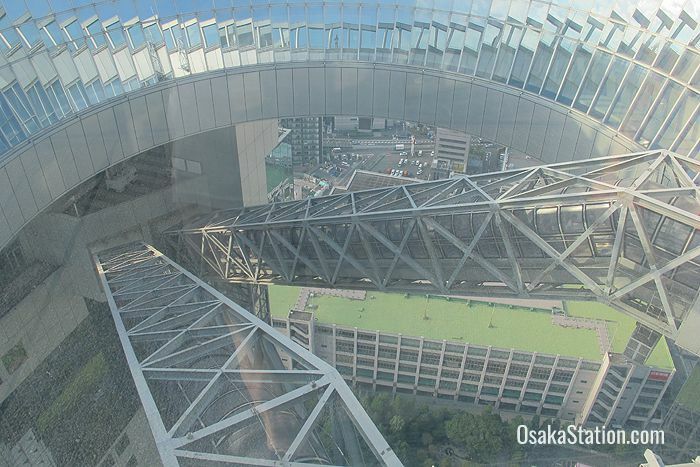 Umeda Sky Building is a strikingly unique and very shiny high-rise structure of glass and steel which stands tall and aloof in an open area to the north of Osaka Station. 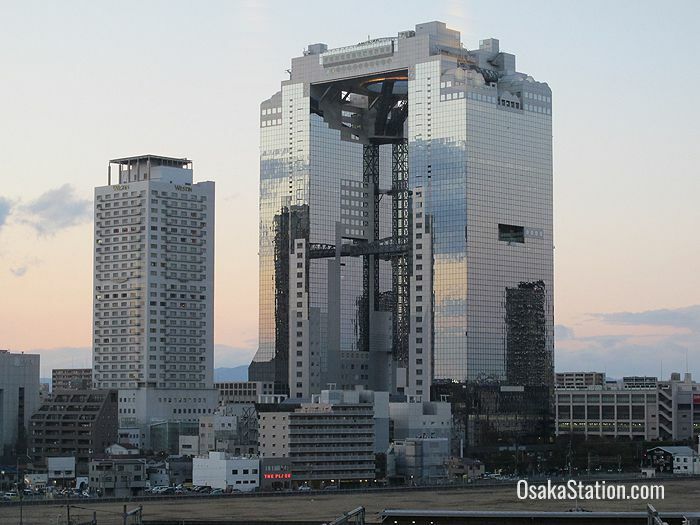 Designed by Hiroshi Hara, the Japanese architect who also designed Kyoto Station, and completed in 1993, the 173 meter tall building consists of two separate towers which are joined at the top by a ring-like observation deck. 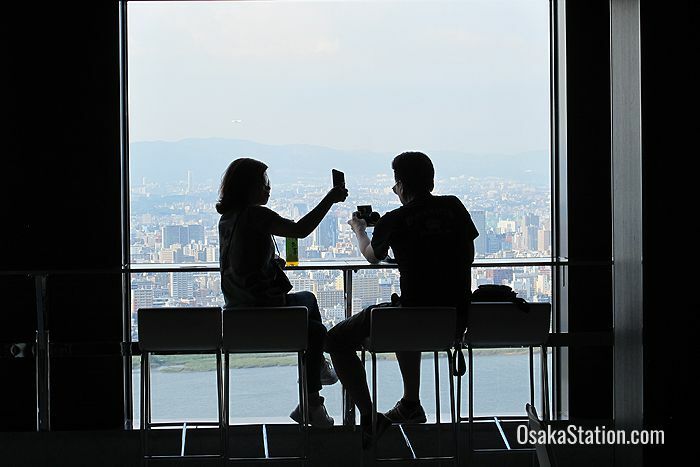 The Sky Building is a familiar sight on the Umeda skyline and also a popular recreation spot with gardens, restaurants, a cinema, and of course the observation deck from which you can enjoy sweeping views over the city. 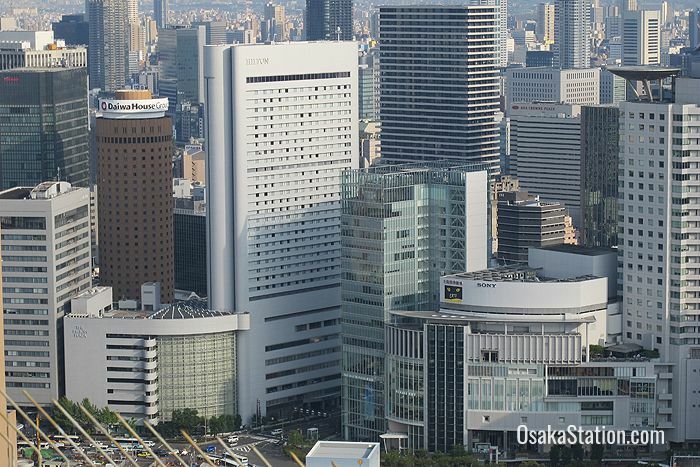 In 2008, the British publisher Dorling Kindersley included the Umeda Sky Building in a “Top 20” list of world buildings that also included the legendary Taj Mahal in India, and Spain’s Sagrada Família. 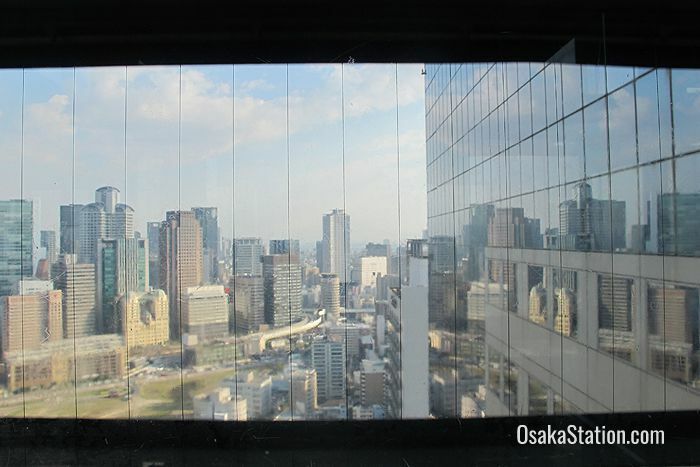 There are various offices, stores, restaurants, and other facilities inside the Sky Building, but the real attraction is the observation deck. 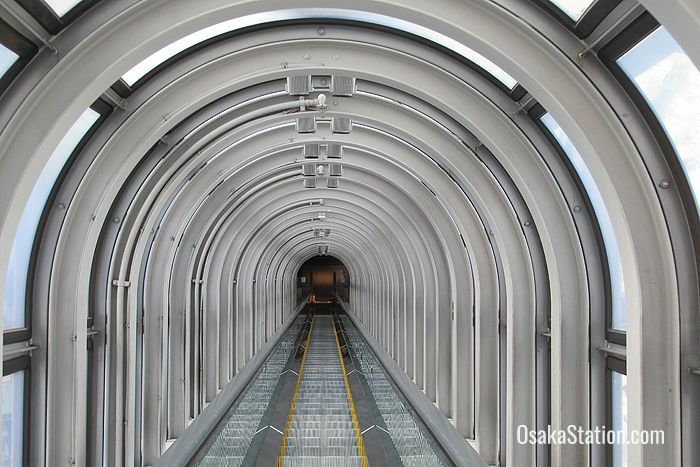 Dubbed the “Kuchu-Teien” or “Floating Garden Observatory”, this “garden” has no flowers or trees, but it is definitely worth a visit for the stunning 360 degree panoramic views that can be enjoyed from the open deck. 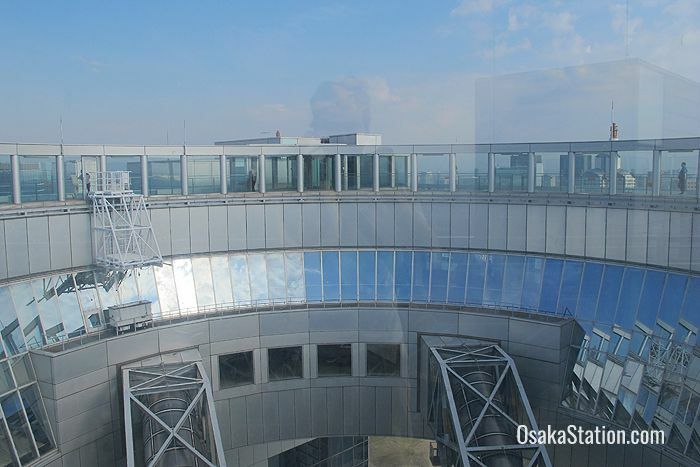 To visit the observation deck, first enter the East Tower and from the 3rd floor take an elevator to the 35th floor. 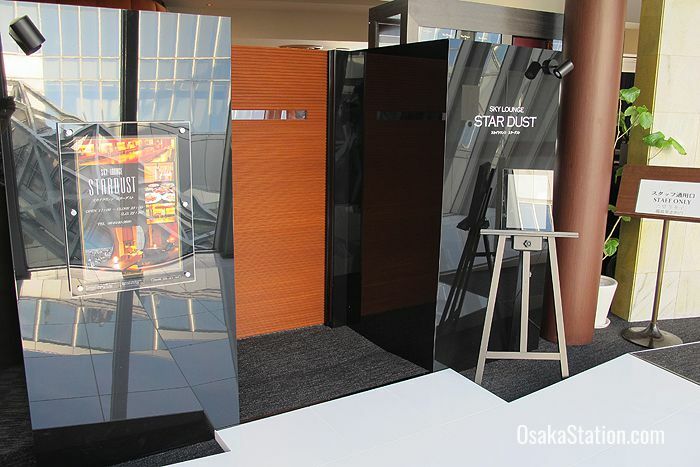 The elevator has windows so you can enjoy exterior views as it rushes to the top. 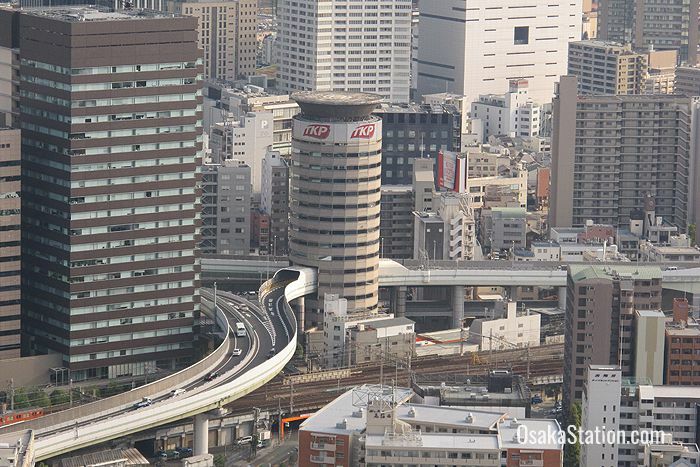 From the 35th floor you then transfer to an escalator which carries you across to the 39th floor of the West Tower. 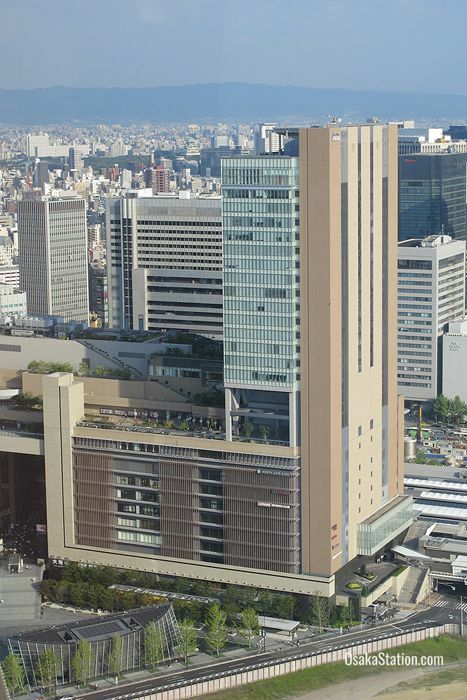 On the 39th floor there is a ticket office where you pay your 1,000 yen fee before going up two more floors to the open roof top “Sky Walk”, but remember before you step outside to take off any hats and not to carry an umbrella. It can get really windy up there! 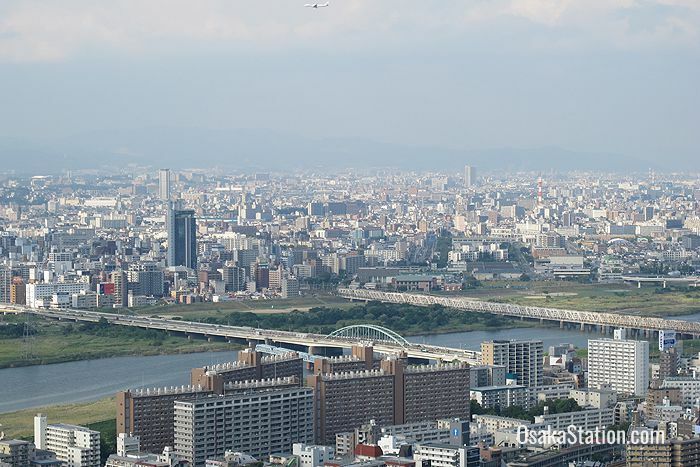 The views from the Sky Walk are incredible, and being so high up above the bustling city with no noise except the sound of the wind gives a profound sense of peace and tranquility. 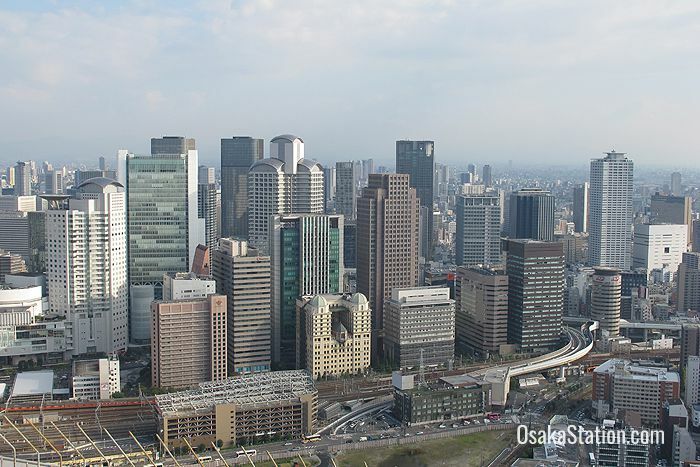 It is also fun to look around and see how many buildings you can recognize. The Floating Garden Observatory is open from 10.00 until 22.30 but last entries are at 22.00. Because the observatory stays open till fairly late, you can also enjoy a night view of the glittering city. 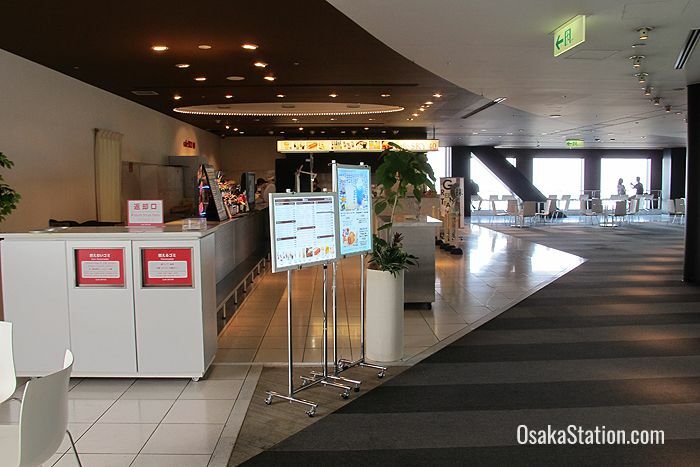 Immediately below the Sky Walk on the 40th floor is a café called Sky 40. Serving creamy lattes, fruit sodas, sweet tarts and ice cream, this is a good spot to take a break while continuing to enjoy the view. 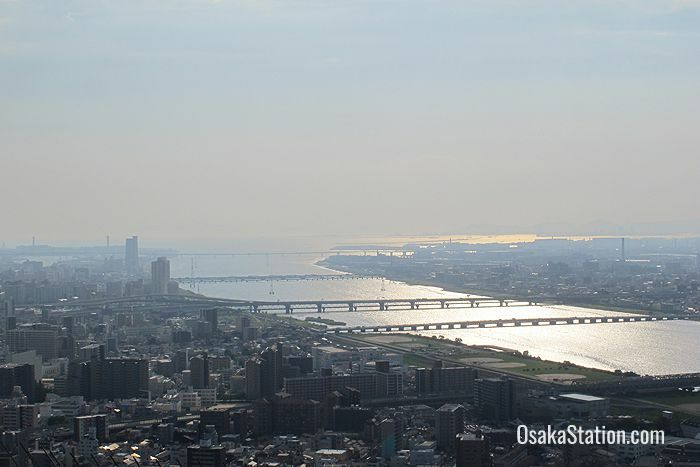 On the 39th floor there is a souvenir shop called Sky 39, a bar called Sky Lounge Stardust and a Chinese restaurant called Sangu. Naturally both the bar and the restaurant have window views and so make for particularly romantic spots in the evening. 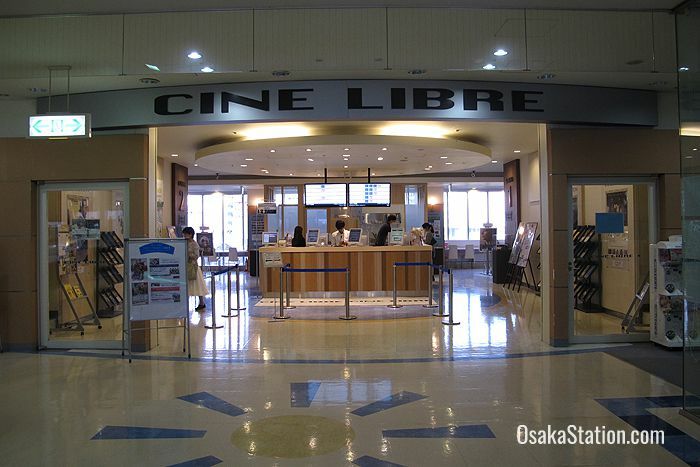 Cine Libre is a four screen art-house cinema on the 3rd floor of the East Tower which shows a range of movies from both Japan and overseas. 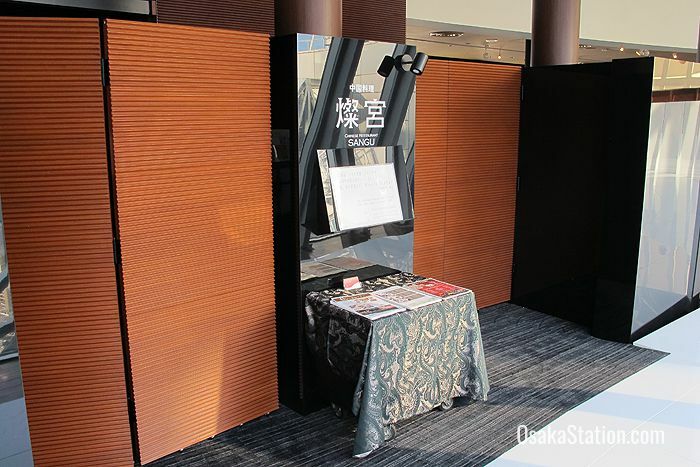 In the basement of the Sky Building there is a gourmet restaurant area which is designed to resemble the streets of the early and mid-20th century Showa era. 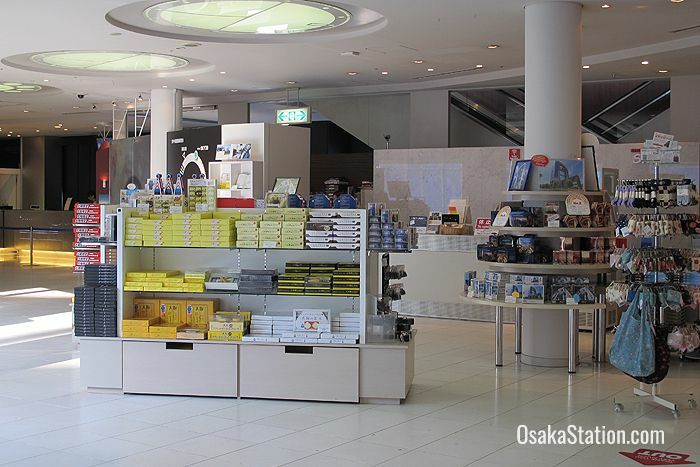 There are 20 different restaurants here serving everything from local dishes like okonomiyaki savory pancakes and takoyaki octopus dumplings, to more international fare like Indian curry and a French restaurant specializing in cheese and wine. 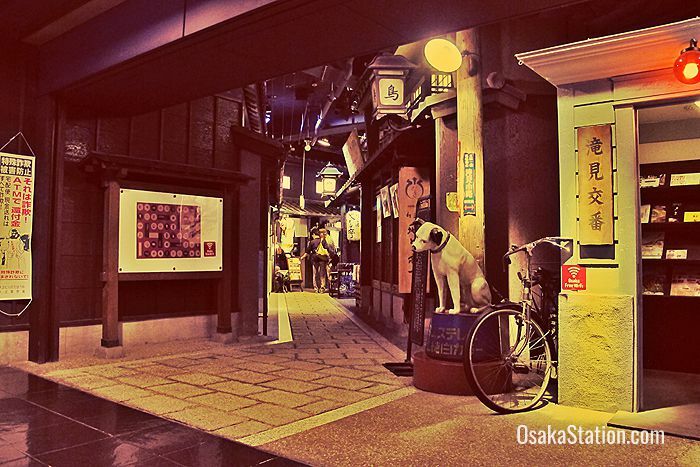 Even if you aren’t hungry, this area is worth a visit just to enjoy the sense of taking a trip back in time. 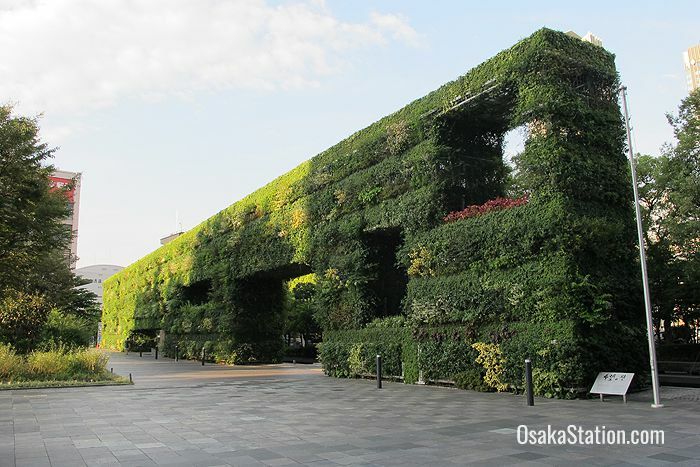 There are a series of gardens and green areas around the base of the Sky Building. 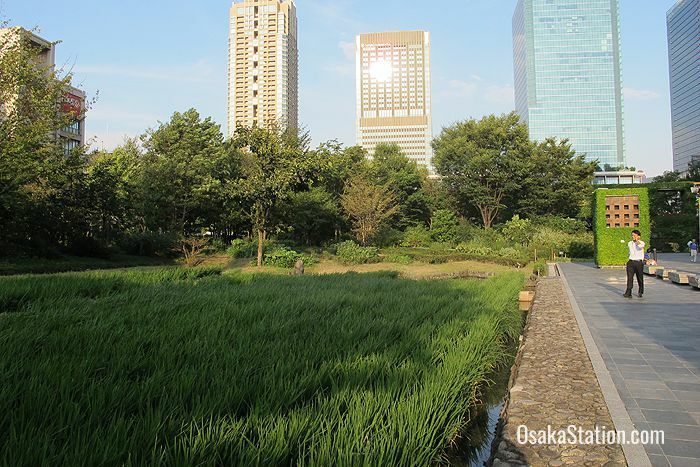 “Chushizen no Mori” also called “The Island Garden Forest” is landscape garden of trees, rocks and water between the two towers which is meant to act “as a green sanctuary in the midst of techonology”. 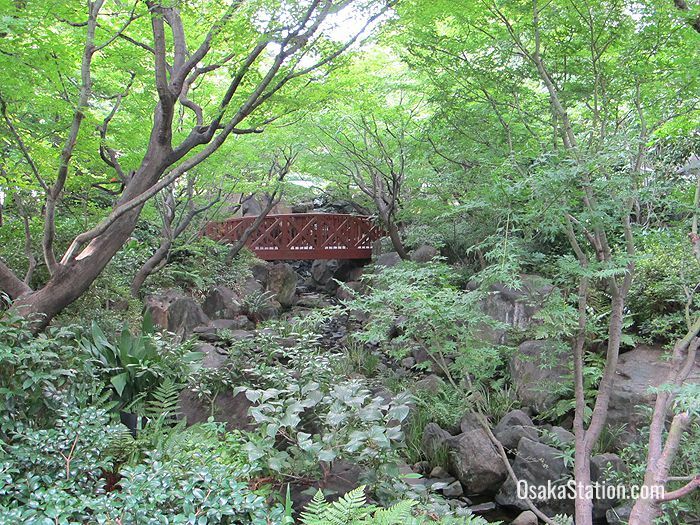 One can walk through this garden in order to reach the Westin Hotel. Along one side of the building is the 8000 meter square “New Satoyama” section, a semi-cultivated area which is meant to encourage the natural growth of various plants, trees and flowers, including some endangered species. This section is intended to attract various insects and butterflies and bring a touch of the natural countryside into the heart of the city. At one end of the “New Satoyama” is the “Wall of Hope” which was designed by the famous minimalist architect Tadao Ando. This wall is a 9 meter high and 78 meter long blockish hedge of shrubbery and flowers which was added to the gardens in 2013. The wall invited controversy when Motoo Yoshimura, the original landscape architect responsible for these gardens, viewed it as an unpleasant intrusion on his own design and claimed it was in breach of his copyright. Despite this protest the new wall was installed and is now promoted as a “new model for urban greening and nature restoration”. 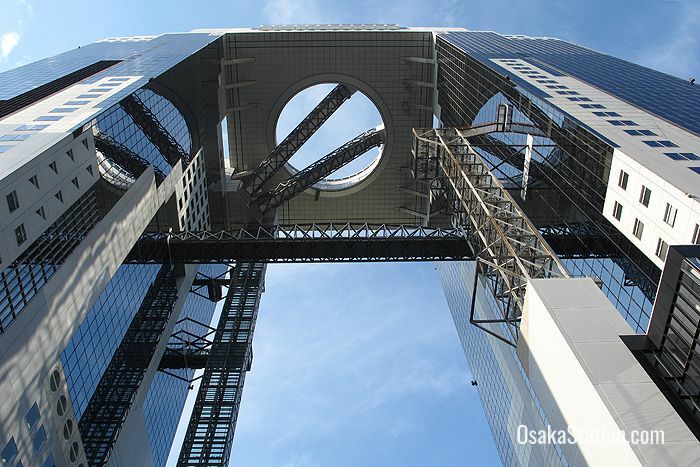 The Umeda Sky Building is an 11 minute walk north of Osaka Station.